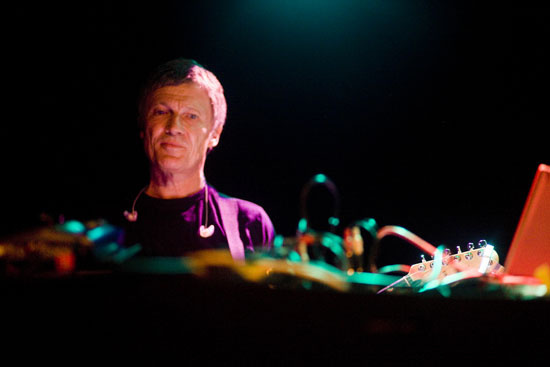 Michael Rother's pedigree as a Krautrock pioneer is close to unparalleled, with a roster including Kraftwerk, Neu!, and more recently, Harmonia, his project with Cluster's Hans Joachim Roedelius and Dieter Moebius. But it is his work with the much-missed motorik innovator Klaus Dinger for which he is best known. Latest project Hallogallo was originally intended as a reunion of sorts with Dinger, before the drummer's tragic death in 2008. Now Rother is making his first appearances in years, with Hallogallo 2010 – consisting of Rother, the majestic Steve Shelley of Sonic Youth on drums, and bassist Aaron Mullan of the Tall Firs. Though widely advertised as playing Neu! material, this project – named for a track on the original duo's eponymous debut record – makes new forms of recognisable Krautrock tropes, playfully parodying the current trend for classic band reformation, carefully walking a line between Neu! and neu. Cornered recently before Hallogallo's set at Incubate festival in Tilburg, Rother avoided giving too much away, but promised variations on familiar themes, never losing sight of the tireless innovation that characterises his work. Petra Davis (words), Jonny Mugwump (audio) and Stu Green (images) met with him for the Quietus to explore populism, propulsion and collective retrofuturism. Audio is below.